3-11-97, 23 51.11 N / 75 07.23 W, 44 nm to Conception Island. We are now in what are called the "Out Islands" - off the beaten track. If Georgetown could be compared to Rossport (Lake Superior) as a turning point, the Out Islands are like the East Shore of Lake Superior. The cruising crowd thins out and with good reason. Not only do the distances become greater but it is all windward work - you work for every mile of "easting" you can get. Conception Island is one of the most beautiful islands we have seen yet - very wild, uninhabited, long sandy beaches, and a bird sanctuary. The birds are beautiful white Tropic Birds with long swooping graceful tails. There is excellent coral for snorkeling with forests of stag-horn coral which comes up so close to the surface that in order to traverse them you literally swim through canyons. We are now in Columbus' territory, San Salvador is just around the corner. It is an eery feeling to walk the beaches where the New World was discovered and (aside from the debris now washed up on the beaches) we imagine that it is just as pristine as when he first discovered the islands. The whole interior of the island is a large man-grove swamp which we entered and explored with the dingy. We have seen very large green sea turtles that swim with amazing speed. We had 3 lay-over days here. We started the water-maker for the first time and it worked! The first few times it was nothing short of a miracle to watch sea water changed into drinking water right before our eyes. 3-16-97, 22 21.13 N / 73 00.38 W, 148.6 nm to Mayaguana. Beautiful weather window. Left Saturday morning - course 128 degrees all the way to Mayaguana - something unheard of for these parts where the prevailing wind is E/SE. Saturday we had light southerly winds at 6 knots and so had to motor-sail. We heard on Herb's net of a squall line which we charted with his coordinates, it past through about 8pm. After a few rain showers and a little increase in wind, the wind was N/NE and after the squall and we were able to sail. The wind piped up in the morning. We set anchor in Start Bay at Mayaguana at 10:30 am after 26 hours. 3-17-97, 21 44.55 N / 72 17.28 W, 77 nm to Provo, Caico Is. Didn't like Mayaguana anchorage, it was 40 feet deep and we couldn't get in closer because of coral. There was poor protection and we would have to move 8 miles to the other end of the island if the wind switched SE. The forecast was for strong winds starting mid-Monday and lasting for 3-4 days. With two other boats we decided we could extend the "weather window" (forecast for Sunday evening was 15 knots from the N) by sailing through the night (52 nm) to the west entrance of the Caicos. Pulled anchor at 2000. Single reefed main and reefed genny. Fast trip. We kept reefing down so we wouldn't arrive before daylight. Daylight at the entrance of the Sandbore Channel (9 miles of coral along the north side of channel Sandbores on south side, channel interspersed with coral heads) presented us with very confused seas. The wind was increasing with complete cloud cover. There is no way we could attempt the channel with any degree of sanity. The weather window has closed. Turned off to go around the west and south end of West Caicos and then take the Clear Sand Road Channel 14 nm over the Banks (no coral - least depth is 10 feet) into Provo. The Banks are uncharted. Wind 25 knots gusting to 30 right on the nose. Motor-tacked with full main on very tight tacks to stay in the charted channel. We made good about 3 nm per hour. Six miles from Provo we were hit with a rain squall and winds in excess of 30 knots. As we turned to run off, the traveler sheeting jammed and a weird torque developed between the boom and traveler. The main-sail ripped at the sheeting points but that was short lived and stopped when the boom gave way and bent. The squall went past and we got the main down and secured the sail and boom. Rolled out just enough genny to make headway. Now we needed larger tacks because we couldn't point as close but fortunately were able to keep good depths. Set the anchor at 1330 in Sapodilla Bay. 3-18-97 thru 3-25-97, Found an excellent machine shop and outstanding machinist. Wednesday morning with the help of other sailors we cut the boom in half at the bend so we could get the sail off and transport the boom to the shop. The main sail was repaired, the rips were not big at all. The machinist put an aluminum sleeve into the boom and welded it. It appears to be much stronger than before. All in all, we are doing pretty well. We were pretty tired when we set anchor Monday after having done 2 night passages in a row and then the ordeal of beating up that 14 mile channel. After securing the boat we went down and to bed. Happy Hour that night was pretty sobering as we considered our alternatives. We are very fortunate that it happened here where there is someone who can weld aluminum. 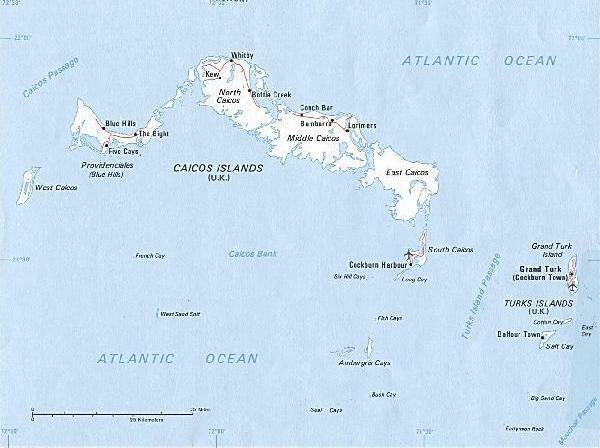 We are presently at Caicos Shipyard, 8 desolate miles out of town. The boom was supposed to be ready Friday, now they say Tuesday (3-25-97). The guy who is doing it says he'll deliver it. On Thursday, March 20th we took off our wedding rings. It was the first time Ron had removed his since I put it on in our wedding. I've had mine off a couple times for cleaning and repair. We've been told it's best not to wear any jewelry at all in depressed countries like Dominican Republic because it invites mugging and thievery. We put them in a safe place on the boat, but it feels strange to be without them. It's little things like this that sometimes get through to me. 3-26-97, Fax from Caicos Shipyard. I can't emphasize enough the importance of using weather windows in this area. When they come, you go like crazy and then sit for days/weeks until another opens up. The boom was delivered this morning - it looks great. Ron is presently painting the repair and putting all the fittings back on the boom. The repair looks much stronger than the original boom. We probably will not buy another boom until we are back in the states. We are heading out now and will be making our way to the Dominican Republic. 3-27-97, Seven minute phone call ($2.50 per minute!). They had trouble clearing customs because the phones and electricity were down and they couldn't call in. They finally got a jeep ride the 8 miles from Caicos Shipyard to town and tried to clear. The customs office was out of forms! Finally they found some and are set to leave. A weather window has opened and they are headed to Dominican Republic tomorrow, it is 150 nm. They are not sure how long they will spend in Dominican Republic and will call/fax again from Puerto Rico. We left Caicos Shipyard 6 am on Friday. Excellent weather window for making easting. Motor-sailed SE across the Caicos Banks in light (6 knot) NE winds. Depths 8 - 10 feet. Cleared the banks through a reef at 2:30 pm. How good it felt to be in deep water again without soundings. Arrived Luperon 8 am on Saturday morning, 149.8 nm. Clearing customs without an interpreter was an interesting experience to say the least. Normal cost is $10 U.S. for each passport, we got socked with $40 total. Without a doubt the DR is the most beautiful place we have seen since leaving L. Superior. There is no way to adequately describe the beautiful panorama which greeted us with the dawn on that Saturday morning. After the low scrubby islands of the Bahamas (with the exception of Conception Island), the DR mountains lush with tropical foliage, complete with the pungent odors of a tropical paradise, literally overwhelmed us. As we wound our way through the bends of the channel banked by high rising vistas, we were greeted by so many of our friends who had previously shared anchorages with and who had heard of our Provo experience via the "cruisers telegraph". It was quite a homecoming. Quickly we were once again absorbed into the cruising community. There is a small "marina" here with a large open air bar under a thatched roof canopy. Happy Hour is each nite from 1700 - 2000 and we all gather to share the day's experiences. A cubra libre (rum 'n' coke) is 15 pesos ($1), a Presidente Grande (large beer, equivalent to 2 US bottles) is 20 pesos. The town of Luperon is very quaint: pigs and chickens in the streets, small dirt roads, worn cement block buildings built right up to the street's edge, people mingling everywhere going about the day's business, rapid fire Spanish, old cars and motor bikes weaving in and out, open air markets (the pineapple is so sweet), good restaurants with excellent inexpensive island food. The other day we were having lunch on the upstairs veranda of one of the restaurants and a bus caught fire on the street beneath us. Everyone left to go and help put the fire out - you can imagine the excitement and confusion. Luperon is absolutely delightful. Luperon is a good place where one can safely leave a boat and tour the country. With 3 other couples we rented two small canvas enclosed jeep-like vehicles with 4-wheel drive for a week. With nothing more than a couple of back packs, we headed inland. Our first stop, we hiked a mile inland to a series of cascading waterfalls where we hired Dominican guides (no English) who took us swimming through deep canyons and right up the waterfalls using ropes/vines and hand/foot holds in the rocks. It was a very challenging experience and some of our party didn't make it to the top - only with great perseverance (stubbornness) did we both make it. Coming back down was equally challenging, we slid down the waterfall chutes worn through the rocks, jumped off rock ledges 20 feet into the pools, just like in the movies - Indiana Jones has nothing on us. We also visited La Isabella, the oldest European establishment on the hemisphere where Columbus established his first base. I can't tell you what a thrill is was to be standing in the doorway of the ruins of Columbus' house looking out over the bay as he must have, watching his ships at anchor. We then took the jeeps for 2 days into the mountains, the Dominican Alps 10,000 feet up. It's a good thing we had 4 wheel drive. With dirt roads and hair pin curves it was quite an experience. At one point we drove for well over and hour up on the spine of a ridge with deep plunging valleys on each side. In some parts the vegetation is quite tropical and it was interesting to see trees with Spanish moss, conifers, and palm trees growing side by side. Words nor pictures can even come close to describe the breathtaking, lush panoramic views we experienced. Our trek took us through countless little villages in the back country, many of which are perched right on the side or top of the mountains. Hazards to navigation included pigs, chickens, sheep, oxen, Brahma bulls, and little children running around in their birthday suits. We ate in the local "restaurants" with the locals - eating what they ate. The food is especially delicious. We began to learn Spanish by immersion. Often we would order something and get something completely different. We began with oink, moo, baaa, flapping our elbows like chickens and eventually graduated to cerdo, fillet, cordero, and pollo. Although the standard of living is lower than in the cities, everyone seemed content and happy. Food is plentiful, the soil is rich, and water is everywhere. The Dominicans here are a very gentle and beautiful people. Their skin is a light cinnamon color, some of the women are outstandingly beautiful. Their disposition is especially kind and generous. In many villages, we were quite a curiosity. It seemed everyone wanted to help us and please us. We loved the back country. Then there are the cities. To balance the experience, we visited Santiago, Jarabacoa, Constanza, and the capital Santa Domingo. None of us liked the cities. They are very dirty, loud, and congested. We still found many gracious Dominicans, but the hustle, complete with pan-handlers, was very prevalent. Driving in the cities is really hazardous to your health and it didn't help that we arrived in Santa Domingo during rush hour on Friday night. We stayed in the "old town" (lots of congestion and very narrow streets) which may have colored this a bit. With frayed nerves and inaccurate maps, we finally found our hotel, one of the oldest buildings in the city, beautifully restored in heavy Spanish design. After unpacking and with a fair dose of cubra libres in the center courtyard things seemed to pick up a bit and we ended the evening in a jacuzzi on the roof top overlooking the city. The next day we hired "Nelson" (who spoke some English and had befriended us the day before) to be our guide and show us the historic spots. This turned out to be one of the best decisions of the trip. Santa Domingo was the first real city in the New World and the place where Columbus died, they have a huge monument building and museum. We visited 16th century ruins and Dominican monasteries (hence the name of the country). All very interesting. We were all anxious to leave and once again enjoyed the drive through the lush country-side back to Luperon. We have had alot of interesting experiences in the last week which I think others may be interested in hearing about. In comparing notes with other cruisers, we are the only ones who have really gotten back into the back country and the mountains. A lot of people take a bus into Santa Domingo (4 hours one way), stay over night and tour the city. But few have done what we have, that's why we were such a curiosity on the mountain villages. We are presently looking for weather windows to began our trek down the NE side of the island (about 150 nm) and then across the Mona Passage to Puerto Rico. This time is looks like we will be traveling with a number of other boats, which helps. We were alone on the passages to Mayaguana and from the Turks and Caicos to Luperon. They have noticed a distinct difference once they entered Puerto Rico: they can easily get mail and make phone calls to the states now. They made it across the Mona Passage just fine, motor-sailing in light wind. Half way across they switched diesel tanks and the engine was a bit fuel starved, they are investigating now to see if there is gunk in the filters and tanks. 4-9-97, 18 01.18 N / 67 10.66 W, Arrive in Boqueron, Puerto Rico. Left Luperon 1600 Monday April 7th. Herb gave us a good 3 day weather window so we decided to head straight for Boqueron. 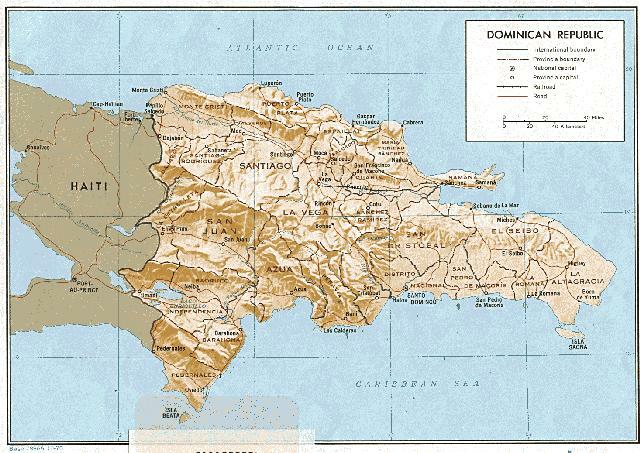 There are a few anchorages on the NE coast of the Dominican Republic (DR) and those are open roadsteads exposed to the north which get a pretty good roll in anything north of east. Samana on the east coast of the DR is the usual departure point for crossing the Mona Passage. In recent years, security has become a real problem with dingy and motor theft. We decided to take advantage of the window. The whole coastline of the DR is beautiful with lush mountains and valleys. We went past Puerto Plata the first night, the shoreline was lit up for miles. On the second night, as we rounded Cabo Cabron and Cabo Samana, there were palm tree fires high up on the bluffs. One was so large it looked like a volcano against the dark night sky. The dreaded Mona Passage was reasonably complacent and we crossed it on the second night and last day. Waiting for weather windows certainly pays off when going to windward on the "thorny path". We arrived in Boqueron at 2000 on Wednesday April 9th. With some tacking the total passage was 268.1 nm. Boqueron is a neat tourist town which boasts a large sand beach. It gets pretty lively on the weekends as Puerto Ricans come from all over to enjoy the ocean. Spanish is the primary language but most people are bilingual. It is nice being able to use 800 numbers, U.S. currency, and laundromats again. There is definitely the flavor of being in a foreign country but being a U.S. Territory softens the edges a bit for gringos like us. 4-15-97, 17 57.81 N / 66 55.52 W, Ensenada, Puerto Rico. Pulled anchor at 4 am and sailed around the SW corner of Puerto Rico. The trade winds are pretty strong along the south coast and the trick seems to be to leave during the night when the trades die down quite a bit. We also try to make our anchorage by mid-morning before they pick up again. As it was, we had 20 knots right on the nose with short steep chop for the last few hours. 4-16-97, 17 57.38 N / 66 17.59 W, Salinas, Puerto Rico. Left at 3 am - motor-sailed against light easterlies to Salinas, 33 nm. 4-17-97 through 4-19-97. Rented a car with another couple for 3 days. Thursday we toured Ponce and took advantage of big stores to re-provision. Friday we drove across to the north end of the island (up and over the mountain range which is the spine of Puerto Rico) to the capital San Juan. Toured Old San Juan and visited El Morro which is a very impressive fort built in the 1500's to guard the entrance of the harbor. Visited other historic structures and had lunch in a lovely open courtyard restaurant. In the late afternoon we drove to Fajardo in the NE corner where we spent the night. Saturday we drove into the mountains to El Yunque which is a large tropical rain forest. We spent the day hiking trails back into waterfalls and up vigorous trails to high towers perched up on the peaks for magnificent views of the mountains and rain forest. Hiking in a rain forest is pretty neat, there are lots of beautiful flowers (orchids) and birds with strange haunting calls. 26) Message from St. Thomas in the U.S. Virgin Islands, 4-30-97. They have arrived in the U.S. Virgin Islands. They stopped at the island of Culebra which is 20 mi east of Puerto Rico and 20 mi west of St. Thomas. Ron had an abscess in one of his teeth and they had to find a dentist to take it out. 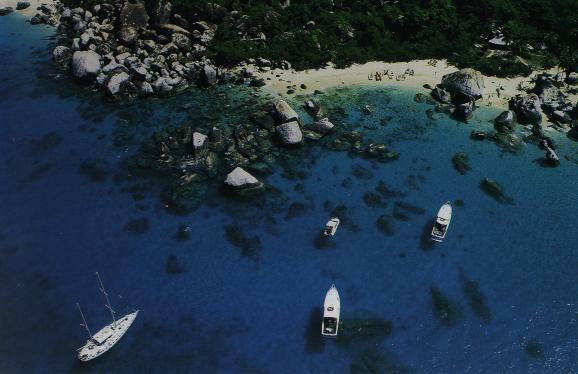 5-2-97, They called today from Roadtown in Tortola and left a message, the VHF radio (transmit) went out. I will be bringing them one when I visit them. The refrigeration is still having problems, they have someone coming tomorrow to look at it. They are trying to get to Grenada by June 15th to get far enough south that hurricanes are not a problem. 4-21-97, 18 09.21 N / 65 26.79 W, Vieques Island in the Spanish Virgins. 4-22-97, 18 17.96 N / 65 19.95 W, Cayo de Luis Pena. Lovely island west of Culebra in the Spanish Virgins. Beautiful little sand beach. Interesting snorkeling at one side of the bay. Remote - almost had the anchorage to ourselves until another boat came in at 1900. Ron has an abscessed tooth and has been on antibiotics for two days. 4-23-97, 18 18.26 N / 65 17.92 W, Ensenada Honda, Culebra. Beautiful harbor, anchored next to town. Refrigeration not working again. We convinced a refrigeration fellow out to boat - no English. Find a leak in tone of the lines. Thursday Ron takes ferry over to Fajaro on Puerto Rico to have tooth pulled and get a new part made. Installs new part on Friday but refrigeration person too busy to re-charge system on Friday and he goes over to St. Thomas for carnival on Saturday. Sunday morning his cousin come out to the boat and recharges the system. After the refrigeration is "fixed" we wait two days for weather. 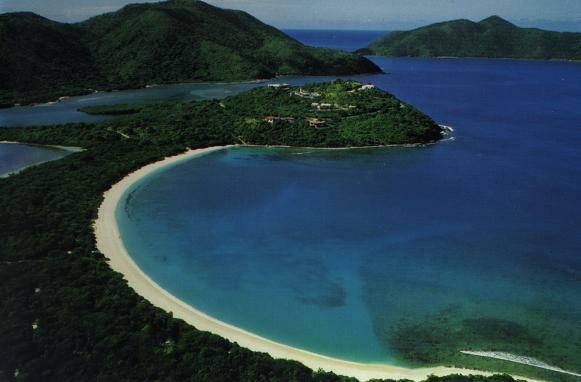 4-30-97, 18 18.54 N / 64 47.42 W, Caneel Bay, St. Johns, U.S. Virgins. Wind finally dies down, have a lovely sail over to the U.S. Virgins. By pass St. Thomas. Stop at La Cruz Bay to pick up a mail package and have a little lunch. Motor up to Caneel Bay and anchor beneath high rising green vistas - just beautiful. 5-1-97, 18 21.62 N / 64 44.80 W, Francis Bay, St. Johns. Distances sure are short in the Virgins - all of 3.6 miles to our next anchorage! We can't get over the beautiful mountainous green terrain. Anchorages are pretty deep, not at all like the Bahamas. We try snorkeling at a couple of spots - the reefs are less beautiful than the Bahamas. Refrigeration is not working. 5-2-97, 18 24.96 N / 64 36.89 W, Road Town, Tortola. Anchor up at 6 am and run into Road Town to see if we can get help finding refrigeration leak. Check into customs, check out moorings - none available until Monday. We find a highly recommended "free lance refrigeration fixer" who agrees to come at 9:30 Saturday morning. Get groceries and fuel. VHF radio not working - can receive but not transmit. Rush to call Peter to bring us one when he comes next week. 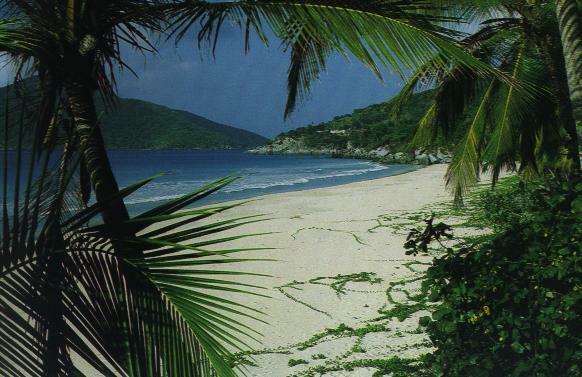 5-3-97, 18 24.29 N / 64 36.02 W, Little Harbor, Peter Island. Hard to find leak in refrigeration system, it leaks only when pressure is in it. We find the leak at one of the expansion valve fittings, fix the leak, and re-charge system - 1 1/2 hours. Not too bad for a Saturday morning, we hope the fix holds this time. Get a few more things and sail over to Peter Island, 3.5 miles. 5-4-97, 18 27.65 N / 64 31.68 W, Marina Cay. 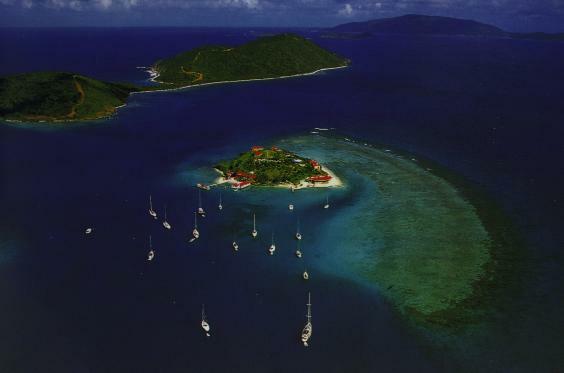 Leisurely sail (10 miles) on 15 knot SE wind over to Marina Cay off the NE end of Tortola. Relax. Run refrigeration and water maker. 5-5-97, 18 79.10 N / 64 32.01 W, Trellis Bay, Tortola. Move over to Trellis Bay, next to airport to wait for Peter and Dianne who are coming to visit later in the week. 27) Message from the British Virgin Islands, 5-21-97. 5-9-97, 18 79.10 N / 64 32.01 W, Trellis Bay, Tortola. Cruised the BVIs with Peter and Dianne. Places visited were Cane Garden Bay (Tortola), Green Cay, Little Jost Van Dyke, Soper's Hole (Tortola), The Bight (Norman Island), Little Harbor/Deadman Bay/Sprat Bay/Great Harbor (Peter Island), Roadtown (Tortola), Cooper Island, The Baths/Spanish Town/Bitter End (Virgin Gorda). Winds each day were E/SE 15-20 knots with a few higher gusts. Did lots of snorkeling. Especially enjoyed the underwater caverns at the Baths. 5-19-97 Saw Peter and Dianne off Monday morning. Trellis Bay on the North Side of Beef Island is an excellent place to bring in crew. The dingy dock is right in front of the general store and the airport is a 5 minutes walk. No taxis are needed. Customs is right at the airport. It is 4,550 miles from Bayfield WI to the Virgin Islands, 1,265 miles from West Palm Beach to the Virgins. Crossing The Stream: we shouldn't have to reiterate the importance of waiting for weather. We waited for 8 days at Lake Worth and had a quick and gentle crossing from W. Palm Beach to Lucaya on G. Bahama. It was well worth the wait. Exumas to Georgetown: because if our late crossing (mid January), we only have knowledge of the Berry's and Exumas to Georgetown. It is possible to successfully cruise the Exumas with a 6 foot draft boat. Yes, there were a few anchorages we couldn't get into that we would have liked to, but 5 1/2 foot would not have done it either - we would have had to be 5 foot or less. With the prevailing easterly winds, it is pretty easy to sail down the banks side and not be held up for weather. It is however, an exhilarating experience to by sailing at 6 1/2 knots in 20 knots of wind with only 2 feet of water under the keel. The only wait for weather we had was in the last jump "on the outside" in Exuma Sound to Georgetown - we waited for 4 days for the winds to lay down. Communications: you can purchase Batelco Debit Cards ($1 per minute) but by far the best way to communicate in the Bahamas is by fax. Most islands that have any kind of a settlement have a Batelco Tower - often the phones don't work but wherever there is a tower there is a fax machine ($1 per page). If you are going to stay in one place, you can also receive faxes for free. We communicated with family and friends from Georgetown through Exuma Markets. Georgetown: is where lots of people meet in the Bahamas, some stay all winter, most turn around and head back to the Abacos and the States. Few venture east into the Outer Islands. Reasons: the distances become quite long and now you are dealing with the incessant trade winds. Georgetown straight to "I 65", turn right to Tortola. We know of a few boats that did this and kept track of them via SSB. It took them 10-12 days. It is hard to get that long of a weather window, all ran into some kind of rough weather and some turned off in the Caicos. Also, the problem with this option is that you miss the Dominican Republic and Puerto Rico. Ride the northers to offset the E/SE trades, through the islands. Unfortunately, this year the northers never materialized or reached down that far south. We know of a number of boats that waited 4-6 weeks for the northers in the Outer Islands and even caught up with them in Luperon. We cruised with boats that waited all winter season before and went back to the States to try again this season. Wait for the trades to lie down in late winter/early spring. The trades which generally run 20-30 knots often knock down to 15-20 knots in April, May, and June. Sometimes they are less than 15 knots. This is what we did but we were very lucky with weather. Again, the problem with these last two options is that there are still some large distances involved (160 miles or greater) and you need to have adequate weather windows. You also need to be willing to wait for the windows and be ready to take them when they come. We missed 1 whole day of a good window from the Caicos to the DR because the customs official to give us clearance out never showed up after he said he would. The boats that didn't go with our group from Luperon, DR to Boqueron, and to Puerto Rico ended up waiting two more weeks for another good window. Weather Reports: Regardless of whichever option you choose, obtaining accurate weather information is essential. There are two main sources for this area and both require SSB. The first is the computerized Offshore Weather Report (NMN) from Miami. The problem with this report is that it covers such large areas that it often lacks detailed information for a specific area. It is helpful to have small laminated charts and a tape recorder for recording the information. The second source is Herb (12359) in the afternoons. Even if you don't get on the net, careful listening will usually give you the information you need for your area - your own tailor made broadcast. Once when we were speaking with him he used satellite photos and told us of a squall line which was going to hit us in a couple hours - and sure enough, it did. A final word about SSB. It is not only essential for cruising these waters but we think it is also very important to be able to transmit. There are a number of cruiser nets where folks keep track of each other - and it isn't just social and idle chatter - safety is also and important element. Those boats which have receive-only receivers are sorely short-changed of a very important element of cruising these waters. Going to weather here with the large distances involved means motor-sailing - there is just no other way around it. All the people we sailed with or talked with were motor-sailing. About half with just the main; others, like us who needed all the power we could get, used the main and small jib sheeted in tight. A full-battened main with a large roach is a definite asset. We are glad we put in a new engine in our 20 year old boat before we left. We often wish we had gone with 35 hp instead of the small 27 hp. Of the boats we cruised with, we had the smallest engine, others all had 40 - 50 hp engines. With our 35 foot length, we were also the smallest boat. Most boats were 38 - 42 feet and we also traveled with a couple 50 footers. "Coasting" the DR and Puerto Rico: sliding down the NE coast of the DR you are generally in the lee until you round the capes. Unfortunately, the anchorages along the north coast are open to Atlantic swells and often quite rolly. Because of this and Samana's recent reputation for dingy theft, we jumped at a 3 day window and went straight from Luperon to Boqueron - 261 miles. Coasting along the south shore of Puerto Rico is another story. The main tactic in beating the trades is to get up at 3 am (ugh) and go lickety-split to the next anchorage so you're in by 8:30 am before the winds come up. One couple we met, who have been down here 4 years, said the first year they thought they would never get around Puerto Rico - in fact, they only made it to Salinas where they ended up spending hurricane season. Again, we were very lucky and only got beaten up once and actually had some nice windows where we were able to make good easting. 28) Fax from Antigua, 6-3-97. After seeing Peter and Dianne off we returned back to Virgin Gorda Sound to wait for weather for crossing the Anegada Passage. We rejoined our friends and it was a great time waiting for weather complete with pool side amenities and a beach barbecue on the last night. Leave for St. Martin 11 am Thursday morning. Winds E/SE 10-15 knots. This is the last of the big notorious passages - the Anegada. Once again, we lucked out by waiting for a weather window. The trip was uneventful except for the last few hours. At 1 am we were hit with a pretty good thunderstorm and lots of rain. We are now dealing with "tropical waves" which come in from the Atlantic. They are disturbed weather patterns which later in the season can develop into tropical storms and hurricanes. One of the women on another boat gave everyone a pretty good scare when she said she thought she could see a water spout. The storm lasted one hour. Then it was fair conditions until just as we were coming into Marigot Bay when we were hit by another one. The deluge of rain made coming in difficult even with radar. This isn't even the rainy season yet. We set anchor at 4 am - 86.9 nm. Marigot Bay is delightful, very French. Bonnie got to try out her high-school French, thank goodness most people here are bilingual. A duty free port with lots of little specialty shops and excellent restaurants with delicious French cuisine. Wind E 15 knots, close hauled with some tacking - 25 nm. Beautiful, high-rising mountainous islands. Very green and lush. Remote anchorage, did some snorkeling. Wind E/SE 15-20 knots, close hauled and beating 51.5 nm. Wind E/SE 15-20 knots, close hauled and beating - 48.2 nm. We had not intended to go to Monserrat because of the volcano but had a bad angle for Antigua. Anchored in a little harbor at the north end where there was less chance of ash drop. The volcano is impressive at the southern end with a perpetual cloud of ash. It is in "condition orange" which means it could go at any time. The south end of the island is evacuated to the north end, many people living in make-shift shacks. The government offices are non-existent, no customs to check into, people just trying to make it day by day. Wind E at 20 knots, close hauled and beating - 39.4 nm. Anchored in harbor adjacent to famous English Harbour - just a short walk (1/4 mile) across. 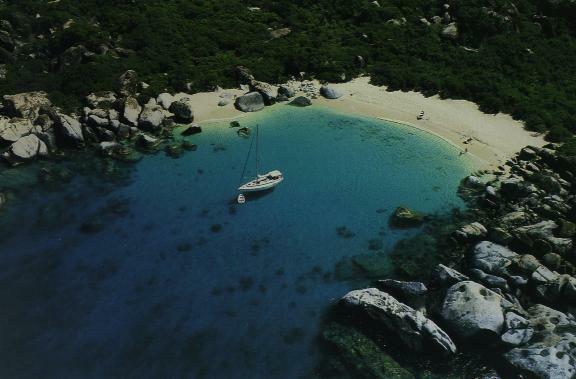 Home of Nicholson Yacht Charters, the first charter group in the Caribbean. This area really caters to the sailboat industry: sail makers, marine parts, electronics, along with the usual novelty shops, restaurants, etc. Beautiful harbors surrounded by lush picturesque mountains. We plan on taking an excursion up to Shirley Heights for a famous view and photos. Waiting for weather now to make the 42 mile run south to Guadeloupe. 29) Fax from Bequia, 6-17-97. We spent more time in Antigua than we would have liked. We have been having trouble with the refrigeration for the past 2 months and it went out again. We replaced everything including the compressor except for the holding plates and copper tubing. It seems to be working alright now. We got a late start from Antigua. Wind E 15 knots. Nice sail to Guadeloupe. We love the high rising mountainous islands. Deshaies is very French, quaint little town, breakfast next morning at a sidewalk cafe. It is a neat place. Wind E/SE 20 knots, quite a beat to the Saintes. It took 4 hours to make the last 12 miles. The Saintes are a lovely group of islands 6 miles off the south coast of Guadeloupe. We would have loved to spend more time in Guadeloupe but feel we have to press on to work south before hurricane season sets in. Today our GPS sum log turned 5,000 nm since leaving home. Wind E/SE 20 knots. Big seas coming from the Atlantic through the gap between the islands. They are big rollers, the largest we have seen yet. We are traveling with three other boats and their hulls are completely hidden in the troughs. Dominica is by far the most beautiful island we've seen in the eastern Caribbean. Very mountainous, lush, and green. Reminiscent of the DR, the mountains are not as high, but much more tropical. Took a "tour" of a Carib Indian Village, had lunch up in the mountains, visited Trafalgar Falls, and came back with more green bananas and grapefruit than we can ever eat. We picked them in the wild. The next day we took a trip up a wild tropical river with a local in an old wooden boat, Disney has nothing on this. At the end we had very potent "home brewed" run punches in a remote thatched roof open air "tiki bar". Wind E/SE 20 knots. This time the rollers were not quite as big between the islands. We weathered a couple good rain squalls. St. Pierre is another small French village. Its main distinction is that it lies at the base of Mt. Pelee which erupted in 1902 and obliterated the town. On this date exactly one year ago we left the Apostle Islands for Isle Royale. Sailed down the coast in the lee of Martinique, the wind funneled around and soon we had 15 knots right on the nose. Anse Mitan is a lovely peninsula at the south end of the big harbor which bisects Martinique's western coast. Fort de France, one of the largest cities in the Eastern Caribbean lies on the northern side of the harbor. On Thursday we took the ferry across to take in the sights and do some re-provisioning. However, it soon became apparent that the motto was "don't buy it unless you need it" as this is the most expensive island we have been to yet. We were able however to get some very inexpensive French table wine. Wind E 15 knots. Nice beam reach in moderate seas. We now come to an area which is getting a bad reputation on security, theft, and harassment by boat boys. So unfortunately we are moving through this area very fast. Both Rodney Bay and Marigot Bay have had reported incidents. We had no problems in this isolated cove, but took security precautions. We are traveling with two other boats. Wind E 10-15 knots. Beam reach, nice sail. Sailed beneath the Pitons on St. Lucia. Absolutely breathtaking. 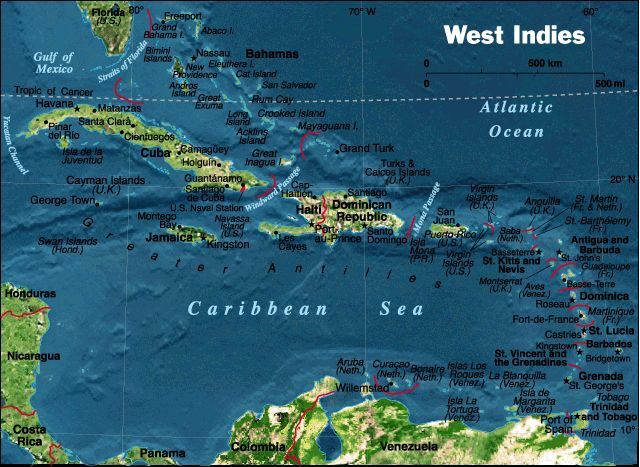 It is too bad that this once favorite stop in the Eastern Caribbean is now off the list because of harassment by boat boys. According to the SSB "coconut vine" it has been so bad with them climbing on your boat that friends of ours had to pull anchor and leave. We wonder if they got the message as they sat in their boats waiting for us to come in and saw 8 boats sail right by. Nice crossing to St. Vincent. Unfortunately, St. Vincent has an even worse reputation for theft and we all sailed right by this one too. Again, will all the boat boys sitting and waiting in each little harbor. It leaves boaters two options: to sail through the night to avoid both islands or so as we did and risk a stop at St. Lucia and then the long haul to Bequia. We now look forward to spending some time in the Grenadines and then heading to Prickly Bay on the southern coast of Grenada - below latitude 12. We spent a leisurely week visiting some of out old favorites from 2 years ago and exploring new spots: Virgin Gorda Yacht Club and Spanish Town, Trellis Bay, Cane Garden Bay, lunch at Foxy's on Joust Van Dyke, St. Francis Bay on St. John's, and Christmas Cove. The wind was all easterly 10-15 knots. Lovely sail, how nice it is to go downwind! Wind E/SE 15 knots, wind on wing. Culebrita is truly a wilderness anchorage with a long sand beach. Lots of sea turtles in the anchorage coming by to poke their heads up to give a look over. Snorkeled on the reefs, hiked all over the island. Sailed into Culebra to get customs and immigration clearance for Puerto Rico. Spent two days trying to find a customs officer who apparently was "off the island". Finally got clearance via telephone because we are American citizens and we had the current 1999 Customs Sticker in hand so we could give the numbers over the phone. Without this we would have had to wait for the customs officer to return. Went out and anchored behind the reef which was disappointing for snorkeling. Another great sail - wing on wing. Wind E 10-12 knots. Even yet another great sail - wing on wing, wind was E 12-17 knots. We have done so much sailing in the past 2 weeks that we've only used 5 gallons of diesel to run the refrigeration twice a day. In Salinas we meet up with some old friends from South Africa that we were with 2 years ago in Venezuela. There is still some hurricane damage left over from Georges. Get a mail drop and the new inverter Peter sent. (The old one blew out). Lovely sail to "Coffin Island" as it is called, wind E 10-15 knots. Coffin Island is a National Park with a number of nice hiking trails. We hiked up to the light house for a great view of the island and the south shore of Puerto Rico. A really grand sail!! Wind was E/SE 15-17 knots. We just rolled out the genny and sailed the 45 miles into Boqueron. We had planned on two stops along the way to visit some places we missed a couple years ago - but the sailing was too good to stop. We are now waiting for a weather window to cross the Mona Passage. This is about a 3 day passage to Luperon, Dominican Republic. We had hoped to begin the crossing early on Wednesday morning to take advantage of the full moon during the night. The forecast is for very strong winds (25-30 knots, stronger at night) for Wed-Fri so it looks like Saturday will be the earliest we can leave. We tried the computer and printer yesterday with the new inverter. The computer works fine but the printer won't print - it looks like everything is ok but the pages come out blank. Ron worked on it for about 3 hours, we tried everything, changed the ink, cleaned the nozzles, etc. It is really frustrating, we will have it looked at when we reach the states. To pass the time the next few days Ron is putting on new cleats (the aluminum ones corroded) and I have a couple of sewing projects with my sewing machine. In transit in the Mona Passage to the Turks and Caicos - a little more than 300 miles. We had intended to go into Luperon in the Dominican Republic but the weather was favorable for continuing on and since there were northerlies projected we decided to "make our northing" while we could. The first day was a little lumpy (wind NE 15 knots) out to the "hourglass" shoal but the rest of the passage was uneventful. 4-3-99, 21 11.82 N / 71 15.03 W, Big Sand Cay, Turk Islands. We set anchor in the afternoon over a beautiful rippled sand bottom. Had a barbecue with a boat from South Africa that we have been traveling with to celebrate the passage. The next day we explored this beautiful island by hiking and then snorkeling the reefs in the afternoon. We had forgotten how beautiful the snorkeling is here. We were accompanied by some barracuda and we saw a large shark. Interesting islands but impossible to go ashore because of the steep undercut bluffs. Marginal for easterly winds, luckily the wind is not very strong. Interesting to sail over 45 miles of banks in 10 feet of water. The clarity is excellent and we can see everything - it helps that there is little wind or sea - but then it's a motor trip. Arrive in Provo in the afternoon and clear into customs. Have to go into town the next day to clear into immigration. Taxi is expensive - $16 for two people round trip to go 4 miles. But then everything in Provo is expensive. Tomorrow we head 60 miles to Mayaguana, the first of the Bahama Islands. We have a number of 60 mile jumps and then they will get shorter. This time however, the wind is with us. What a difference it makes having the wind aft of the beam! Well, we are finally in the Bahamas proper after spending 10 days in the beautiful wilderness of the Out Islands. Nice sail across to Mayaguana, wind E 15 knots. A little tricky getting in behind the reef even with GPS waypoints - the large scale chart is inaccurate and gives the illusion of an accuracy that is not there. Finally came in using a smaller scale (more accurate) chart and lots of eye-ball navigation. Wind light, less than 10 knots from the east. West Plana Cay is one of the most beautiful wilderness anchorages we have been to. Walked for hours on miles of white sand beaches and did lots of snorkeling. Wind west at 12 knots, our course was 270 deg. We thought we were through with going to windward - this is not supposed to happen. We spent and uncomfortable night in an open anchorage (which is perfect for easterly winds) - chafed through two anchor snubbers. Again the wind was almost on the nose - W/NW at 10 knots - a little better than yesterday. Rum Cay is still very remote but does have a small village and marina primarily for power boats who come to fish the reefs. Wind E/NE 10 knots. We had a very nice sail to Conception Island. Like Plana Cays it is very beautiful and remote. Did lots of walking on the sand beaches and snorkeled the reefs - this time on the windward side because the wind was down. Lots of beautiful coral but not much wildlife. A brisk sail close reaching on wind of E/SE 15 knots. No problem getting through the reef - anchored over a sand rippled bottom in 14 feet of water. Wind S, less than 10 knots. Leave at 7 am and are into Georgetown before noon. Come in through the SE entrance. Note: Explorer Charts are an absolute must for sailing the Exumas. Set anchor at Volley Ball Beach. Only about 150 boats total in the Georgetown area which is quite different from the 450 boats here during Regatta Week in March. On Monday we go into town to check into customs and immigration and get our country permit. Exchange some paperbacks at the library, laundry, and pick up a few groceries. We happen to be here just in time for the Family Islands Regatta which begins tomorrow. Today we saw them bringing in the boats on larger ships. We have both been doing well and everything seems to be going well on the boat (knock on wood). The water maker is leaking two cups of salt water per hour. We have rigged a container to catch it so it doesn't go in the bilge as salt water is very smelly. The single side-band continues to be important for both bringing in the weather and making contact with friends. Great sail, wind E/SE 12-15 knots. We had a beach barbecue with friends from South Africa. Wind E/SE 6-8 knots. Motorsailed on the outside/sound side. No problems with cuts going out or coming back in. We snorkeled Thunderball Caves in the morning at low tide. Lots of fish - beautiful. In the afternoon we motorsailed on the banks side, 10 nm to Chicken Cay. Wind was less than 5 knots. Had the anchorage all to ourselves - first time in over 2 years. Almost like wilderness cruising on L. Superior. The next day we went snorkeling in the caves at Rocky ??? and out on the reef at Conch Cut. We saw another large shark. We caught two Bahamians poaching dozens of conch in the Park on the way back. Tried diving for conch at Chicken Cay (outside of the park) and found none. Now we know why they were poaching. Jib sailed on the banks side to Hawksbill Cay, wind E/SE 8-10 knots. Once again the only boat in the anchorage. Nice sail to Allans(sp?) across the banks, wind E/SE 12-15 knots. Note: Explorer Chartbook absoloutely essential for sailing the banks side with a deep keeled boat. Allans(sp?) quite full with boats socked-in waiting for weather before crossing to Nassau. (Forecast had been for stronger winds.) After a couple hours we anchored at the southern edge, almost in the channel. During the night a fishing boat dragged down on us. It took a fair bit to to straighten out as both boats had two anchors out. Didn't sleep much the rest of the night. Great sail up to 5 miles out, wind S 12-15 knots then W 20-25 knots. It was right on the nose as we were coming in accompanied by driving rain. Pulled in the sails and tried to motor, then pulled out the staysail (so nice to have it ready to go) and were able to motor sail right into Nassau. A little tricky winding our way through the reefs. Stayed at the Nassau Yacht Haven ($1.00/foot).